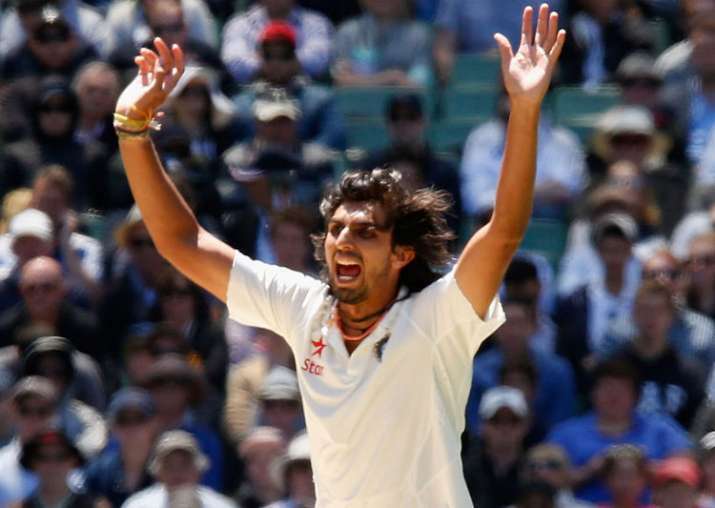 With Bhuvneshwar Kumar not playing the second Test vs Sri Lanka due to his marriage, Ishant has a fair chance of making it to the playing XI after doing his hard yards in the Ranji Trophy. Ishant Sharma gave a timely reminder to the selectors with a hostile spell of fast bowling as Delhi reduced Maharashtra to 59 for 8 after scoring a healthy 419 in the first innings of a Ranji Trophy group D encounter. Despite more than 40 overs of play being lost, Delhi have a fair chance of finishing the match by the third day with visitors till 360 runs in arrears. With Bhuvneshwar Kumar not playing the second Test due to his marriage, Ishant has a fair chance of making it to the playing XI after doing his hard yards in the Ranji Trophy. He now has 18 wickets in his fourth game and bowled enough number of overs in more or less batting friendly wickets. He literally intimidated the Maharashtra batsmen with his pace and bounce with IPL specialist Rahul Tripathi's poor technique against red ball being thoroughly exposed. His figures of 6-2-14-3 is a testimony to the damage he inflicted on the psyche of the Maharashtra batsman. Getting the ball to rear up from three quarter, Ishant first had Ruturaj Gaikwad (0) nicking one to Rishabh Pant behind the stumps. In his next over, it was Murtaza Trunkwala (2) who edged one to Manan Sharma in the slip cordon. Ishant's new ball partner Navdeep Saini then removed rival skipper Ankit Bawne (2), who cut one uppishly to Lalit Yadav at a point to make it 10 for 3. Tripathi, who was one of the finds of last IPL then had a harrowing time facing Ishant's third over. Unlike IPl, where he could plonk his front foot and smash anything across the line, the right-hander looked scared as he was seen shuffling towards leg-stump, clearly uncomfortable while facing Ishant's pace. Tripathi had a release shot -- backfoot punch through covers but Ishant angled one and he guided it to Rana at gully leaving Maharashtra in total disarray at 14 for 4. Rohit Motwani (23) and Naushad Sheikh (12) then added 37 runs before the veteran keeper was dismissed by Saini. There was a short break due to bad light but once play resumed, Maharashtra lost three quick wickets to Yadav (2/2) and Manan Sharma (1/4) for the addition of only seven runs. Earlier, young Nitish Rana's career-best 174 off 264 propelled Delhi past 400, it was the turn of the bowlers led by Ishant to do the star turn on the second day of the match. Rana's innings had 18 boundaries and four sixes as he added 104 runs for the sixth wicket with debutant Lalit Yadav (52). "Good performances in the IPL has made it easier for me to perform at the first-class level. Also, I have learnt to be more patient talking to senior players like Gautam Gambhir," said Rana. Assam 1st Innings 136 (Gokul Sharma 39, Mohammed Mudassir 5/36) and (f/o) 36/2. In Kanpur: Karnataka 642/7 (Dega Nishcal 195, Manish Pandey 238, Mayank Agarwal 90, Karun Nair 62, Imtiaz Ahmed 3/101).